Gilfach Wen is a small farm of 60 acres adjacent to Brechfa Forest. 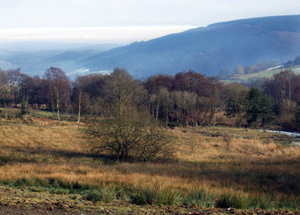 The farm is mixture of pasture with the traditional layout retained of many small fields and areas of ancient woodland. The farm is home to a flock of rare breed sheep, Soay as well as my horses and ponies. We are in the process of establishing a forest garden and a permaculture garden on the farm. An area has been set aside on the farm to form the base campsite for Forest School Activities. This area is suitable for a camp site, is surrounded by mature trees and is near the entrance to Brechfa Forest from the farm. Guests are not limited to the use of the camp site area, other parts of the farm will be available, but which areas depends on the time of year and planned work on the farm. We are happy to meet with forest school leaders and discuss with them the resources they need for their program with their group. The farm is in the Cothi Valley, with views down the valley to the Cambrian Mountains. The nearest village (Brechfa) is about a mile away by road. There is a shop in the village. The nearest public house is approximately 3 miles away in the opposite direction.